This is an idol of Lord Ganesha on an elephant (not real!). Unlike last year could shoot only for 45 minutes as had to go for a movie! Shot in Leica & Nikon D300 (17-55 mm). 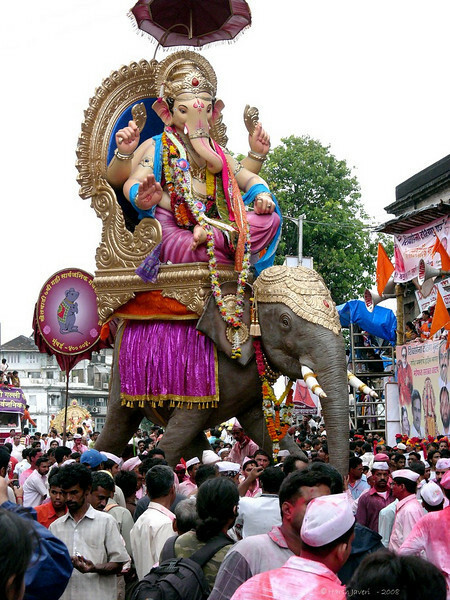 The process of taking the idols for immersion is marked with much fanfare -- loud music, resonating beats and dancing devotees bid adieu to Lord Ganesha only to welcome him again the next year with equal excitement. Fantastic shot -- I love the vertical image rising over horizontal movement. very nice Hershy. Love the colors. Good one. It looks huge. Great crowd/street shot! These photos and the explanations of them are wonderful...Thank you for sharing all of this with us..it is as though we are there!!! Very interesting tradition -- and fascinating shot! While I like the photograph and its portrayal, I do not agree that a tradional more should be destroyed in the name of creativity. Ekdanta(Ganesh the one tusked elephant head god)tradionally has always had a mouse as his carrier, and there is lot of mythological beliefs built around that. And to now have him ride an elephant seems like a total mix up of the tradional festival.